Termite-damaged wood is usually hollowed out along the grain, with bits of dried mud or soil lining the feeding galleries. Wood damaged by moisture or other types of insects (e.g., carpenter ants) will not have this appearance. 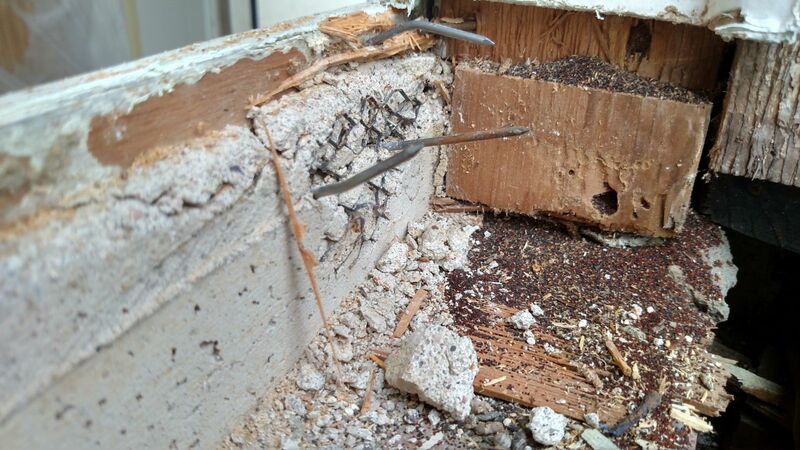 Occasionally termites bore tiny holes through plaster or drywall, accompanied by bits of soil around the margin. Rippled or sunken traces behind wall coverings can also be indicative of termites tunneling underneath. Riding your home of Termites requires special skills. A knowledge of building construction is needed to identify the critical areas where termites are likely to enter. Many of these potential points of entry are hidden and difficult to access. Termite control also utilizes specialized equipment such as masonry drills, pumps, large-capacity tanks, and soil treatment rods. A typical treatment may involve hundreds of gallons of a liquid pesticide, known as a termiticide, injected into the ground alongside the foundation, beneath concrete slabs, and within foundation walls. In short, termite treatment is a job for professionals. A possible exception would be if a mailbox post, sandbox or other small wooden object not attached to the house was infested. "Do-it-yourself" products, sold to homeowners at retail stores or bought over the Internet, will seldom eradicate an existing termite problem.